HEARsmart’s very first campaign, launched in November 2014, was Know Your Noise. We built the Know Your Noise website to help people better understand their own personal risk of hearing loss. On the site you’ll find our noise risk calculator which allows you to plug in different listening habits and sound exposures – real or imagined. We take that information and use it to calculate the risk of hearing damage that’s associated with your lifestyle. You can experiment with the calculator, and plug in different answers to see how your risk changes. 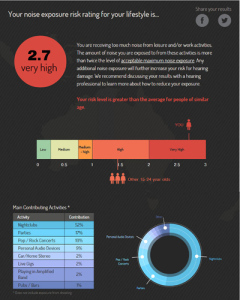 You can also look at how your risk level stacks up against others in your age group. If you’re feeling generous, you can even contribute your results to our research database. We’ll use your data to find out more about noise exposures and develop new strategies for improving hearing health! To keep the risk calculator up-to-date, we use data from the ever-expanding NOISE database, which includes over 900 sound profiles from nightclubs, fitness classes, music concerts, rifle ranges and even a grand prix! New Australian initiative puts the spotlight on personal leisure noise risk. Australian HEARsmart targets unhealthy listening habits.